Hello, Monday. Early morning, couldn't wake up. Ending the night with stuff not finished (or at least rushed through). Not sure how to catch up with the week tomorrow...the whole week is going to be super-busy, can't fall behind this early. Besides work stuff, right after getting home I looked up to see my orange cat on top of the eight foot bookcase. I could deal with that, until he came off the case on top of the 15 gallon aquarium. Thought he was going through the lid! Later, when making my block, my little girl cat jumped onto the 55 gallon, and knocked the lid (and herself) into the tank. Why do they do these things to me? 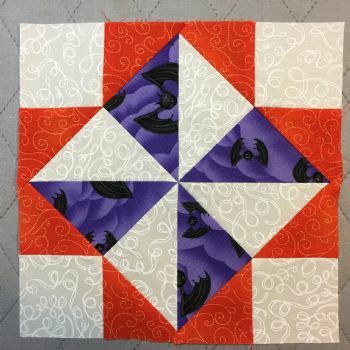 Today's block is fun (and only a little wet with fish water), except I didn't want to make it according to the instructions. That meant I seriously over cut some of the pieces. Ah, well, trimming down is better than having to totally recut.